You can’t judge a movie by its source material: the much-maligned jukebox musical genre gave us “Rock of Ages,” yes, but it also made “Singin’ in the Rain” possible. And we were all worried about “The Lego Movie” before we saw it. So let us be clear that “The Emoji Movie” is not a soul-crushing disaster simply because its dramatis personae are the range of emotive faces and symbols that live inside your cell phone. It is a soul-crushing disaster because it lacks humor, wit, ideas, visual style, compelling performances, a point of view or any other distinguishing characteristic that would make it anything but a complete waste of your time, not to mention that of the diligent animators who brought this catastrophe into being. On a story level, it cobbles together pieces of everything from “The Wizard of Oz” to “Smurfs: The Lost Village” (coincidentally, Sony Pictures Animation’s prior release), and thematically it hits a tediously familiar litany of kid-movie messages: Be yourself. People can be more than one thing. Parents should support their children. Candy Crush is super awesome. OK, that last one is a new feature, since the premise of a movie set entirely inside a smartphone has clearly opened up new potentials of product placement, whether its characters are riding boats down the musical streams of Spotify or walking through other people’s photographic memories in Instagram. As with Sony’s “The Angry Birds Movie,” this is a film that’s shameless about its origins as a pocket doodad; it also resembles that previous film by being completely shrill and stupid. Within the phone of a hapless high-school freshman named Alex (voiced by Jake T. Austin, “The Fosters”), an emoji named Gene (T.J. Miller) excitedly prepares for his first day on the job in Textopolis. The “excitedly” part is a problem, since Gene is supposed to be a jaded “Meh” emoji, but he can’t stop himself from expressing a variety of emotions on his round yellow tennis-ball face. 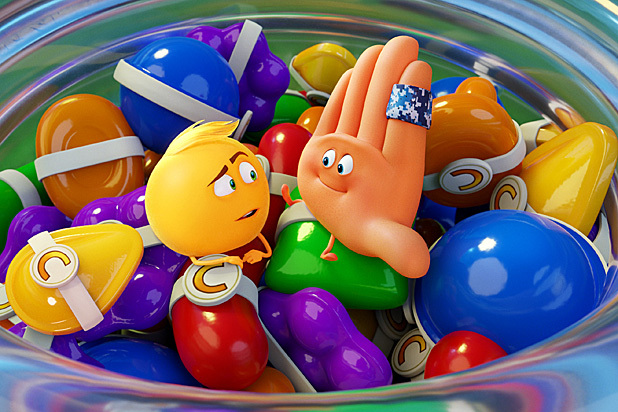 See The Emoji Movie's latest POWER MOVE. His professionally underwhelmed parents, played by Steven Wright and Jennifer Coolidge, worry that his propensity for feelings will get him into trouble, and they’re right: when Alex clicks on him, the scanner registers Gene making a weird nonsense face, which infuriates the perpetually-cheery Smiler (Maya Rudolph), whose face bears a constant grinning rictus even when she’s calling for “malfunction” Gene to be deleted. The unanswered questions are legion: Why do the emojis fear the phone reboot, when they’ll presumably return in its new iteration? Are they different from their counterparts in millions of other phones? Why does Gene have parents when most Americans are constantly switching to new and upgraded devices? And are we really to believe that teen boy Alex never uses his eggplant emoji? Emotionally, we’re supposed to care about Gene and Jailbreak getting together, even though they’re so muddily conceived that we know he’s pursuing something dumb and her desires are merely vague. On top of that, we’re also supposed to be rooting for Alex to win the affections of classmate Addie (Tati Gabrielle, “The 100”), but of course his courtship all boils down to picking the right emoji to text her. Sorry Cyrano de Bergerac and Abelard and Heloise and Cole Porter and anyone else who’s ever used dumb old words to declare love; you’re nothing without a poop symbol. The one non-dispiriting aspect of the “Emoji Movie” experience was getting to see “Puppy!”, a new animated short set in the world of “Hotel Transylvania.” When Adam Sandler outclasses your high-concept, high-tech functions, it’s time to switch to a flip phone. Haven't you heard? Cartoons aren't just for kids anymore! 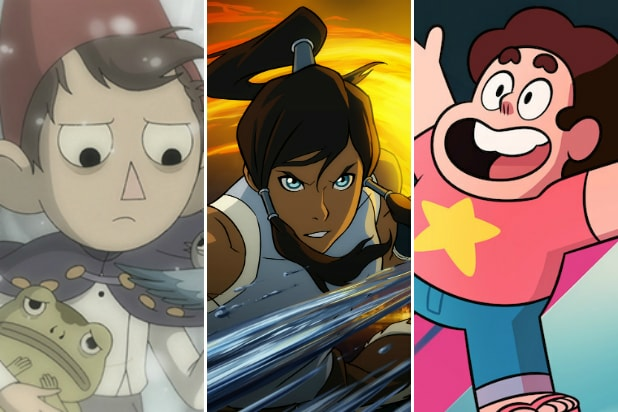 Yes, there are animated shows and films that are made strictly for older audiences ("Venture Bros.," "The Simpsons," and "Futurama" are among them), but there are plenty that straddle the generational line. These are the cartoons that were technically made for a younger demographic but can be enjoyed just as much by adults. Don't be embarrassed. It's the one that started it all. "Looney Tunes" has endured for so long thanks to its mix of slapstick humor and beloved characters, with episodes full of cross-generational, classic shtick that gets passed from generation to generation. Seeing the Roadrunner outsmart Wile E. Coyote and Bugs Bunny beating Elmer Fudd never gets old. There's not enough room to discuss everything that makes "Steven Universe" great, but we can try. It's a cartoon that balances mature storytelling with comedy, that features non-traditional family structures, highlights queer relationships, tackles dark subjects like depression and war, and creates some of the best original songs from any cartoon. It's a total package. This time travel, fantasy cartoon recently returned to Adult Swim for a final season after being canceled in 2004. In total, the five seasons of this blunt and darkly comic show about a samurai who gets transported to a future controlled by an evil demon proved it was one of the most unique shows on television, both in style and substance. This horror story about twins who live with their uncle in the small, mysterious town of Gravity Falls, Oregon only ran two seasons, but there's so much to digest. There are monster fights, colorful characters and a battle against inter-dimensional beings that takes the world into a strange Armageddon. All the while, the twins and their uncle learn to be a family and to look out for one another as the world crumbles around them. This long-running show has been touted to adults since it first aired thanks to its absurd and random humor. As the seasons have passed and the characters have grown, "Adventure Time" has become so much more than its humor -- its highly intricate storyline and the countless theories that have been circulating since its first season that have all come true. This cartoon about two slackers who work at a park was as much for stoners and adults as it was for a young audience. Each episode followed a specific formula: slackers Mordecai and Rigby try to get out of doing work, but then a life-changing, potentially world-ending event needs to be stopped. The two protagonists were out of their depth, but they eventually grew up. This is a must-watch on Halloween. The 10-episode series follows the adventures of brothers Wirt and Greg as they try to find their way home. On the way, they meet all kinds of horrifying creatures -- from pumpkin people to a beast who turns lost children into trees. The show takes a lot from American mythology while creating a tense drama that never lets up. People have divisive opinions about the "Star Wars" prequels, but many of those criticisms don't apply to "Clone Wars," which takes place between "Attack of the Clones" and "Revenge of the Sith." It's a six-season show that expands on some of the best parts of the prequels, while also fixing them. Jar Jar only appears sparingly! Anakin isn't whining! Padme takes control! "Avatar: The Last Airbender/The Legend of Korra"
This isn't that awful M. Night Shamayalan movie. This is the real deal. "The Last Airbender" and its sequel "Legend of Korra" are staples in the fantasy genre. They combine a unique world influenced by multiple Asian myths and martial arts styles, along with memorable characters that grow in realistic ways. "The Last Airbender" is more about childhood, but "Legend of Korra" is about adulthood, tackling issues like trauma and war in a sensitive manner. The Nickelodeon cartoon created by Craig Bartlett followed a group of fourth graders living in the big city, complete with a diverse cast and realistic situations. It ran the gamut of characters, touched upon issues like race, economic status and, over the seasons, told stories about the breadth of human experience. Try thinking about the State Capitols or the countries of the world and not also think about "Animaniacs" and their catchy tunes. The show introduced us to characters like the Warner brothers (and sister) and Pinky and the Brain, a billion catchphrases ("Hellooooo nurse! "), and some of the most dynamic and zany animation ever put on television. The concept was hokey -- gargoyles come to life at night and fight crime. But in two seasons (the third one doesn't count), "Gargoyles" managed to blend comedy and drama for a rich fantasy series. The creators really experimented with storytelling, utilizing concepts such as time travel, magic, romance and Keith David for a vital 1990s flashback. It's become a joke in the public consciousness at this point, thanks in part to its adult male fans, but "My Little Pony," in many ways, warrants its giant audience. It's about young ponies and their adventures growing up and learning about friendship, but it also features intricate jokes and references that keep you hooked. Okay, now we're into the superhero portion of the gallery. First we have the one all the superhero cartoons try to emulate. "Batman: The Animated Series" brought the Caped Crusader to life in a noir-inspired series that had just about everything. Best of all, we had his villains -- old and new (this was the first introduction of Batman mainstay Harley Quinn) -- and a new take on the classic character that has persisted to this day. For many, "Justice League" and its continuation "Justice League Unlimited" were the things that introduced us to the bulk of the DC lineup. It was created by Bruce Timm, who helmed "Batman: The Animated Series," so it had a lot in common tonally with the previous entry on this list, but what made it stand out was how it incorporated storylines and characters from the DC canon so seamlessly and without sacrificing much for its young audience. It only ran for two seasons, but arguably the best Spider-Man cartoon left its mark. The show took the webslinger back to high school, where he had to juggle being a superhero while also being a good friend and student. More than any of the movies or other shows, "Spectacular Spider-Man" understood the essence of the character and focused on his inner turmoil. Plus, the villain storylines -- and the cliffhangers -- are expertly done. Will ‘Dunkirk’ Stay Afloat Against ‘Atomic Blonde,’ ‘Emoji Movie’ at Box Office This Weekend?